The journal Cretaceous Research published an "accepted manuscript" by Nick Longrich in which he suggests that the McLargeHuge Pentaceratops specimen shown above (OMNH 10165) actually belongs to a separate genus, Titanoceratops, and that said genus is the earliest reprentative of the Triceratopsini, an end-Cretaceous group of giant chasmosaurine ceratopsids comprised of Eotriceratops and "Toroceratops. "* Among other issues, Bill Parker has voiced his concern over the practice of journals posting unpublished manuscripts on their websites, a sentiment I share. I'm going to hold off on my critique until Titanoceratops is actually published, but I'm a little iffy about the lines of evidence brought up in the manuscript. I had a few of the same problems with Mojoceratops, but I certainly wouldn't mind if the Austin Powers dinosaur remained viable, if only for it's awesome name. One positive is that the original skull of OMNH 10165 is lacking most of the frill--the reconstruction above is largely extrapolated. So, you know...there's that. Godspeed, Titanoceratops. It looks like 2011 may be shaping up to be another good year for horned dinosaurs, valid or otherwise. *Still waiting to see how this turns out. So sue me. Aren't we all? Even the most diehard "Toroceratops" advocate would see the hypothesis as nothing more than the best fit for currently known data, rather than some ideal Platonic truth. You seem oddly bitter about this whole thing. Not bitter at all, just awaiting further published details. This new species of chasmosaurine is indeed a very exciting addition to the tribe Triceratopini. 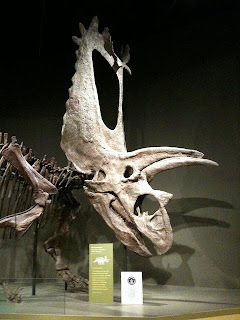 In connection to Longrich's statement about Horner and Scanella's research in his latest paper, I have realized that Nedoceratops hatcheri could be a hyrbrid of Torosaurus and Triceratops, provided that their genomes are similar enough to allow interbreeding among different species. Hybrids do occur in nature from time to time. As for Horner and Scanella's argument, I'm still open to the possibility that Torosaurus could indeed be the senescence stage of Triceratops. After all, only very few individuals live to very old ages in the wild. Again, my position is that in the classification of ancient animals, all lines of evidence must be considered, and all examination methods(anatomical, histological, behavioral, temporal, ecological, and molecular analyses) should be performed whenever possible in order to build a more complete picture of what the world's conditions was like during the reign of the dinosaurs. I would disagree with your idea that Nedoceratops hatcheri was a hybrid of Triceratops and Torosaurus. First off, it does not possess the distinguidhing attributes of any of the two genera you described as its parentals (i.e. the parietal-squamosal suture epoccipital of Triceratops and the lack of squamosal fenestrae of Torosaurus). Secondly, hybridity cannot be ascertained if no DNA analysis is performed.